During 2003 in the spirit of “Waste to Taste” JAM looked forward at the implications of the ‘paperless office’ and considered how the unwanted paperclips could be used. 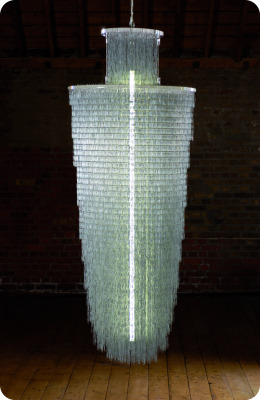 The result was “Paperless”, a stunning chandelier made from 50,000 paperclips. 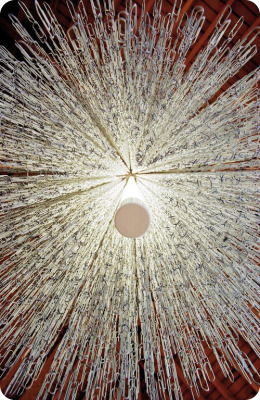 The piece attracted immediately attention by both public and press and was recently featured in the International Yearbook 2004 edited by Tom Dixon. JAM have since accepted a limited number of chandelier commissions. 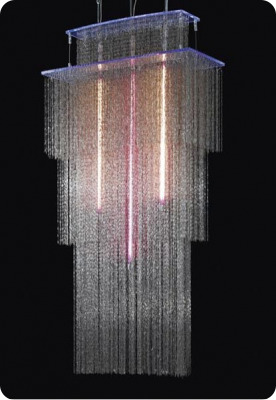 The original chandelier from Sotheby’s went on to be auctioned in New York by Phillips de Pury & Company and has found a home with a private contemporary art collector. It was sold at a price of $40,000.